Thursday 20th March - Being a kid is great - no responsibility, people buy you things, constant holidays etc - but I have a feeling that, had someone else been responsible for me a few weeks ago, I wouldn't have been allowed a pre-dinner ice cream. Apparently, however, I am now a grown up, which means I am allowed to decide for myself whether a trip to an ice-cream parlour in the middle of March just before a big meal is a good idea. In my defence, Chin-Chin Labs in Camden shut their doors at 7pm, so I really had no choice. 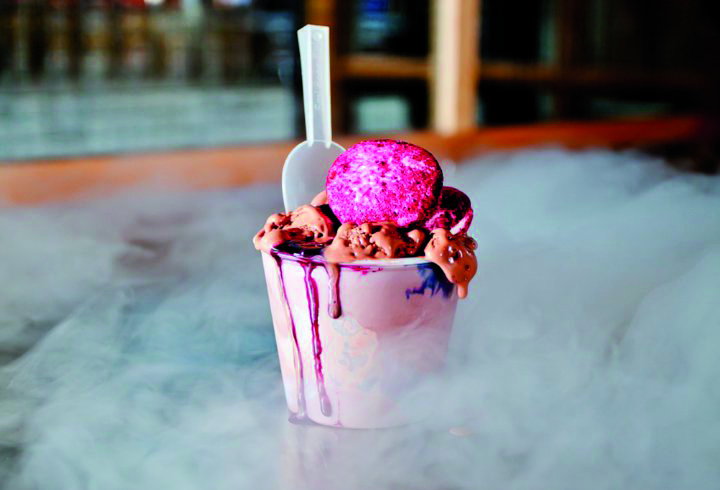 Chin-Chin Labs is "Europe's First Liquid Nitrogen Ice-Cream Parlour" and you can find it opposite Honest Burgers near Camden Lock, from 12pm-7pm every day. The décor is part kitchen, part laboratory, complete with test tubes filled with vanilla pods & conical beakers stuffed full of pistachio & cardamom powder, heather honeycomb & other toppings. Cutting it fine with closing time, I ordered a Pondicherry Vanilla with fellow "grown-up" Taro, and watched as one of the "scientists" poured liquid nitrogen into a food mixer. It's a visual treat and children must go absolutely crazy in there. I was snapping away like a maniac. Moments later, a wonderfully un-sculpted lump of ice cream was plonked into a tub, and we added our choice of sauce / topping - truffle crumble on this occasion. It was stunning - smooth, creamy, super cold and full of flavour, and good value at £3.95 a pot considering all the theatrics. Now they just need to start opening later - rumour has it they might be doing a couple of late nights soon. N.B. There is also Monmouth Coffee, Jing Tea, Egg Nog & Valrhona Hot Chocolate, and you can take away 1/2kg tubs of ice cream for £12.95. After that palate cleanser / aperitif, Taro and I strolled round the corner to Q Grill, London's latest BBQ Smokehouse, where we joined by David. The exterior look is as minimal as it gets (unless it just hadn't been finished yet), but the interior décor is very eye catching with kitchen tools, diagrams of cows and a crafty specials board adorning the walls. It's a big site, with an attractive long bar and a large private dining area at the back taking up some of the space. We had possibly the best seats in the house (ask for Table 5), right next to Q Grill's open kitchen, where we got to watch & listen to Executive Chef Lee Bull keeping his team in good shape. They handled things very well considering the number of covers and it being a soft launch still. Lee has plenty of experience having worked at The Ivy, Le Caprice, Scott's, Daphne's and The Fish & Chip Shop, Q Grill's sister restaurant in Islington (run by restaurateur, Des McDonald). Apparently, more branches of both restaurants are planned. We then sat back with a couple of beers (mostly Camden & interesting bottles such as Quaffing Gravy Pale Ale) and watched as enormous pieces of meat including the 1kg Tomahawk Steak you can see below were chucked on the grill, and raw dishes were prepared further down the counter. 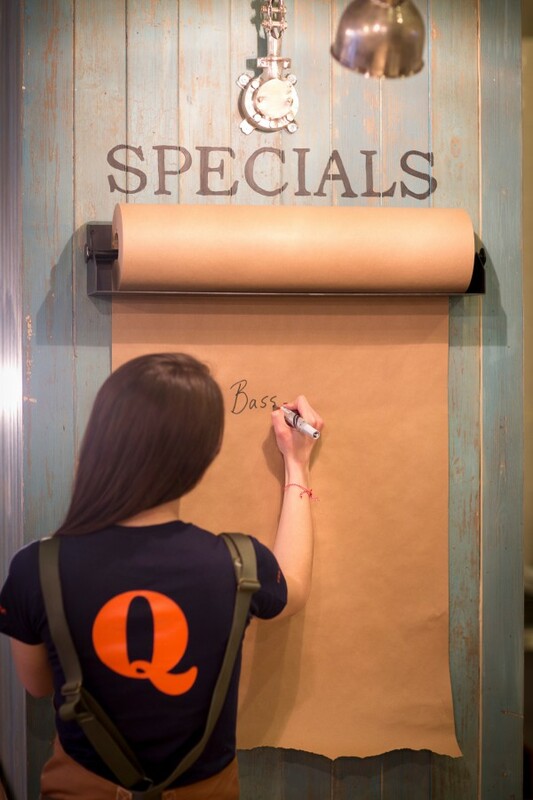 I notice they have added some sharing boards to the menu which might make ordering a little easier. The Fish Board (Seabass Plantain, Tuna Crudo, Q Hot Smoked Salmon, Moonshine Shrimps) is £18 and the Meat Board (Josper Ribs, Flar Iron Steak, Grilled Pig Collar, Pit Roast Chicken) comes in at £27.50. Tomahawk Steak - thanks to the chefs for giving me a shout for a photo op! From the Counter menu we enjoyed Butternut Squash "Hummus" with Charred Flat Bread & Seabass Ceviche with Spicy Plantain. 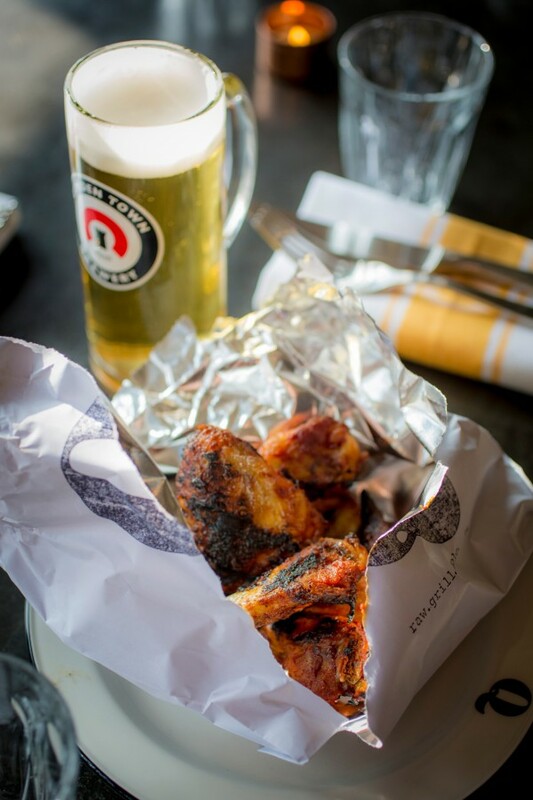 The Cornish Hen Wings arrive in a Q Bag, much like the cornbread at Barnyard & onion rings at The Joint. Our mains included delicious Squid "a la plancha" w/ Smoked Bacon and Pigs Collar w/ Squash & Pecans but the standout was definitely the Beef Short Rib w/ Cima de Rapa & Charred Squash which had been through various stages of preparation adding up to around 30 hours - it showed. We also chucked in some Scrumpy-fried Onion Rings & Seasoned Fries which went down very nicely with their House BBQ sauce. My second dessert of the night was a warm & gooey Bulleit bourbon & pecan tart that almost stole the show, although the bourbon wasn't that prominent and £7.75 seems pretty steep when compared to the £4 puddings at Ollie Dabbous' Barnyard. If you don't get Table 5, sitting at the bar is another great option, and you will want to have a couple of their cocktails whilst you are in front of the bartenders. My boozy Rum DMc stood out, but the Resurrection & a nicely presented Seasonal Julep also held their own, and are well priced at £8.50. It was a fantastic meal full of raw dishes, smoked meats & bold flavours, and there's so much on the menu I want to return for. 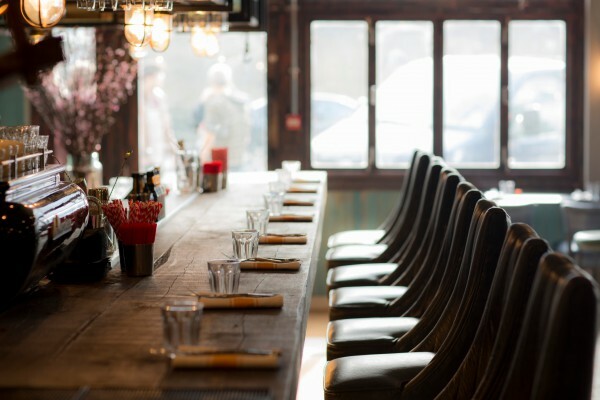 A slight lowering of prices wouldn't go amiss as you can easily reach a pretty impressive total, but they are at a similar level to Smokehouse in Islington, another List favourite, and Q Grill runs a £10 quick lunch menu Mon-Fri 12pm-3pm. Whilst we were out and about, David and I decided to grab one more drink at a local pub. 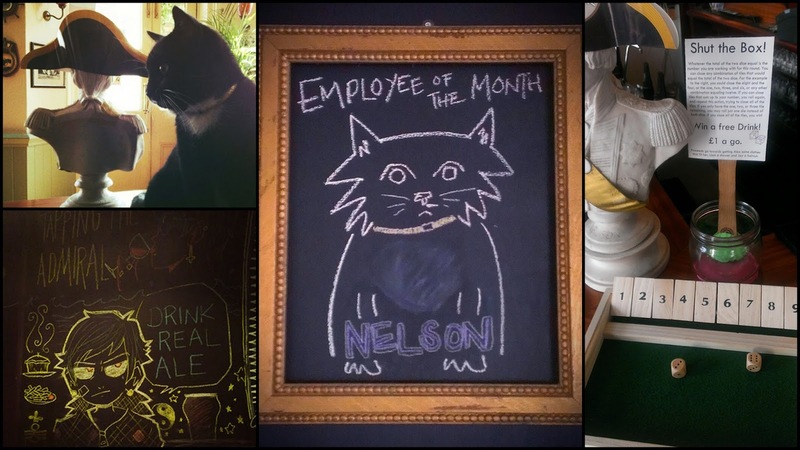 Rather than go for the obvious Camden Town Brewery or Brewdog Camden, we settled on Tapping the Admiral, a brilliant little boozer (with a Thai kitchen) that won CAMRA North London Pub of the Year in 2013. After Nelson's death in the battle of Trafalgar in 1805, his body was placed in a barrel of brandy to preserve it on the long journey home. Legend has it that the crew drilled a hole in the top of the barrel and would use macaroni straws to draw off a little brandy to drink to the naval hero, Admiral Horatio Nelson, hence the term used to describe a sneaky drink: Tapping the Admiral. Camden disappeared as we stepped inside and were greeted the sound of folk musicians who were just playing to themselves on a table in one corner. Then we spotted Nelson, the aptly named house cat who has a rather cosy looking bed & sofa by the open fire. 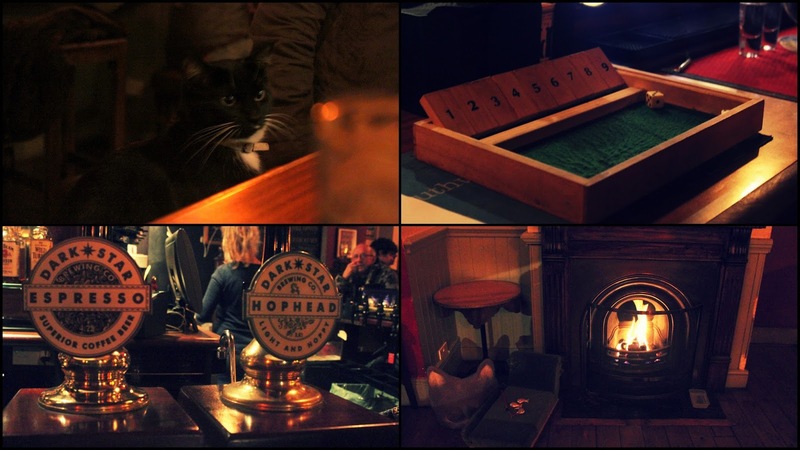 Meanwhile some regulars were playing a simple but addictive bar game called Shut the Box whilst another was learning his lines for a play - were we still in London? We soaked up the atmosphere with some pints of Portobello Star & Dark Star Hophead from their excellent selection of cask ales, before heading back out to the rainy streets of London. I'll be back.